With its power and radiation characteristics, the brand new A8X is suitable for both nearfield and midfield monitoring. With a price/performance ratio that could hardly be better, this monitor is a perfect entry into these monitoring fields. The A8X is equipped with the X-ART tweeter and a large (8.5”) midwoofer, a combination that adds both a very deep and yet very tight bass response to the unsurpassed reproduction qualities of the ADAM proprietary tweeter. The ADAM A8X is well-suited to both near and midfield monitoring. Offering exceptional value with uncompromising performance, the A8X is a perfect entry point to these monitoring fields. Equipped with an X-ART tweeter and large 8.5” midwoofer, the two features combine to create a profoundly deep and extraordinarily tight bass response. As with other AX-Series models, the ADAM A8X’s upper corners are slanted to minimise reflections. In addition, the midwoofer’s large 1.5” voice coil is equalled out by double bass reflex tubes to the front. The ADAM A8X possesses power in abundance with a 50W A/B amplifier and 150 PWM amplifier for the tweeter and midwoofer respectively. The rear panel features multiple controls: a gain for the high frequencies (± 4dB) and two shelf filters for the high and low frequencies. 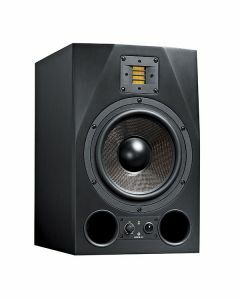 There are both XLR (balanced) and RCA (unbalanced) connectors on the rear panel of the speaker, which allow the A8X to be used in almost any application.